Stems: Erect, simple or openly branched above, glabrous or minutely-hairy, swollen above each node. Leaves: Opposite, simple, thin, ovate to ovate-lanceolate, 1.4 to 6.4 inches long, 1.2 to 4.8 inches wide, pinnately-veined, glabrous or pubescent; margins irregularly coarsely-toothed; tip tapering-pointed, pointed, or blunt; base varying from wedge-shaped to rounded to truncate; stalks of mid-stem leaves .8 to 2 inches long, upper leaves short-stalked or uppermost sessile. Inflorescences: Raceme, elongate, spike-like, 1 to 8 inches long, interrupted, long-stalked, terminal on stem and upper axillary leafless branches; flowers opposite, horizontal, bending downward in fruit; bracts minute. Flowers: Calyx of 5 united sepals, tubular, 1/6 to 1/4 inch long, strongly-ribbed, 2-lipped; lobes of upper lip 3, awl-shaped, bristle-like; lobes of lower lip 2 very short, triangular; corolla of 5 united petals, about 1/3 inch long, 2-lipped; upper lip notched, purple or pinkish-purple, whitish inside, lobes pointed; lower lip 3-lobed, much longer, spreading, pink, lavender, or white, lobes rounded; stamens 4, not extending beyond corolla, arising at 2 different levels in corolla tube; stigma 2-lobed. Fruits: Achene, narrow, ellipsoid, 1/6 to 1/5 inch long, light brown, enclosed by strongly ribbed, closed calyx bent downward parallel to the inflorescence axis. Habitat: Moist woods, thickets, stream valleys; moist, rich soil. Uses: Native American chewed the root to treat sore throats; boiled the root and gargled the liquid for sore throats and took the liquid to treat rheumatism in the legs. 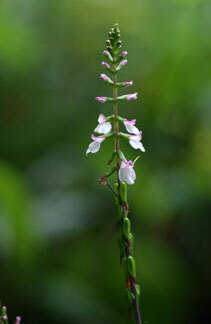 Comments: Greek leptos "fine, small, delicate" and stachys "spike", alluding to the slender inflorecence.